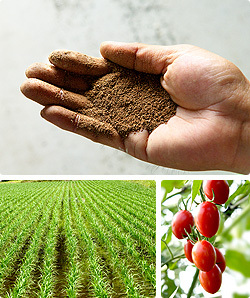 Features : Soil conditioner "Super AKANE" : Agricultural materials | IBE TECHNO CO.,LTD. The property of soil such as keeping water, draining water, and ventilation of soil will be improved. It controls damages caused by continuous cropping and harmful insects. The usage is easy. Just spread on the soil, mix and water. It can be used for wide range. From the field products to vegetables in the kitchen gardens. Improvement of the soil by "Super AKANE" will be realized by making the aggregated structure which has large and small spaces. Water and nutrition are kept well in small spaces. Contrary large spaces let water and air out. The soil will not be affected by change of environment and harmful microbes. The rich well-balanced soil with amino acids and minerals will be made.